Back in 2008, Barack Obama pledged not to raise taxes on households making less than $250,000 per year (and individuals earning less than $200,000). During his administration, almost none of the tax proposals that have come from the White House have crossed that line, in effect forgoing potentially tremendous amounts of revenue. Presidential candidate Hillary Clinton has made a similar promise if she is elected president. It turns out that there is no standard definition of “middle class.” It is easier to define the term “middle income”, which by the simplest definition, would be from the 33rd to 66th percentiles. This corresponds to an annual household income of about $34,000 to $78,000, and an annual personal income from $18,000 to $42,000. Since the concept of “class” often includes many non-income and cultural markers, such as homeownership and advanced education, it is much more difficult to determine a meaningful definition of middle class. Policies are generally aimed at incomes, not classes, as well. Having a broad definition for the middle class might be politically useful. It would exclude a large number of relatively rich people from higher taxes, even in a time when our tax system on the whole is barely progressive. This also can fit with many people’s vision of themselves now or into the future, especially those with middle-class sensibilities, but that have moved or want to move to middle- and high-income jobs. In short, middle-income tax policies would increase taxes on many at the higher end of the income spectrum, but middle-class tax policies that use a broad definition would only tax the super-rich, and not those with high incomes. The Pew Research Center has a substantial body of research on the middle class and those that are middle income. They define middle income as ranging between two-thirds of and two times the median income. For households, that’s between $35,733 and $107,200 per year, which includes over 4-in-10 of households in America. For individuals, the range goes from $18,945 to $56,834, covering more than one-third of them. When a YouGov/Huffington Post poll asked people what they thought were the lowest and highest annual individual salaries to be considered middle class, the median range was from $40,000 to $75,000. Meanwhile, the average range was from $48,773 to $110,136, indicating that a significant number of respondents place the upper range quite a bit above $100,000. It turns out that respondents in households earning less than $40,000 per year placed middle-class between $30,000 and $50,000, while those making over $80,000 set the range between $50,000 and $125,000. Those and similar poll results seem to support Pew’s range of middle-income as those between two-thirds and two times median income. As seen in the interactive below, that would be between roughly the 34th and 78th percentiles of household income, and from the 35th to the 77th percentiles for individuals. What do you think should be considered “middle class”? 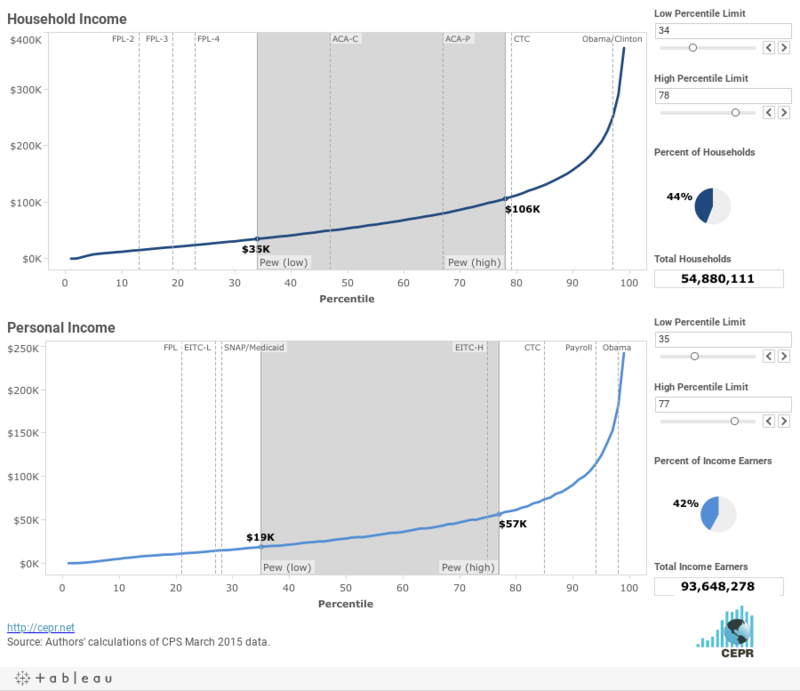 Use the sliders on the right side of the interactives below to select the low and high percentile limits of the middle class, for both household and personal income, using the Current Population Survey’s March 2015 data. (The low percentile limit needs to be below the high limit.) It will show the income range and number of households and income earners in the range. The solid vertical lines denote Pew’s definition of middle income (a calculator from Pew can help you determine where you fall). In addition, the dashed vertical lines provide reference points, as described below. These can provide context to definitions of middle income and middle class (and they can be reflected over the 50th percentile to set both limits). Obama/Clinton: This is the upper limit of the middle class according to Barack Obama and Hillary Clinton (a $250,000 household income). Both have pledged to not raise taxes on households that make less than this. CTC: This is the limit where the child tax credit starts to phase out, for those married and filing taxes jointly. ACA-P: This is the limit where the Affordable Care Act premium tax credits end for a family of 3. ACA-C: This is the limit where Affordable Care Act cost-sharing ends for a family of 3. Obama: This is the upper limit of the middle class according to Barack Obama, a $200,000 personal income. SNAP/Medicaid: Past this percentile in income, individuals are typically no longer eligible for SNAP (food stamps) or expanded Medicaid coverage (130 percent and 138 percent of the federal poverty level). FPL: This is the upper limit of household income for individuals for the Federal Poverty Level, which determines whether a person is in poverty. Payroll: This indicates the percentile at which the payroll tax cap falls. Above $118,500, wages are not subject to the Social Security payroll tax. CTC: This is the limit where the child tax credit starts to phase out for unmarried individuals. EITC-L: This is the lowest upper income limit for the Earned Income Tax Credit, which looks at individual income. EITC-H: This is the highest upper income limit for the Earned Income Tax Credit, which looks at individual income. CEPR analysis of March Current Population Survey (CPS) 2015. The public use version of the March CPS may be slightly different from published Census numbers. Income refers to income in 2014. CEPR analysis of March CPS 2015.